Pickup from Indore airport OR Railway station transfer to Ujjain Hotel. approx. 60 kms / 1 Hrs. After Fresh and change Take Mahakal Aarti and darshan Mahakaleshwar, proceed for River Shipra a place for Kumbh parv. Kal Bairon mandir, Jantar Mantar and Local Temples in Ujjain. Return to Indore and Night Stay in Indore. Morning leave for Omkareshwar approx. 150 Kms/ 3.5 Hrs. 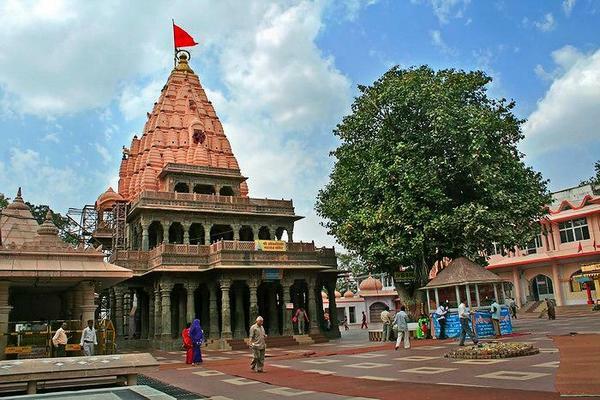 It is popular for having Jyotirlinga temple known as Mamaleshwar temple which is dedicated to Lord Shiva. This temple is also referred as Amareshwar temple. It is located on other side of river for which we have to cross through bridge called Mamaleshwar Setu. After this, also visit Varhdheshwar temple which is another beautifully carved temple and piece of art. Their are many other new & old temples like Gouri Somnath temple, Annapurna temple etc. You can also do boating at ghats like Abhay Ghat, Nagar Ghat etc. Afternoon leave for Indore approx. 70 Kms – 2 Hrs. Late Evening will be at your leisure or you can visit Sarafa market which is famous for food street. Return to hotel. Over night stay at hotel in Indore. After Breakfast Visit full day city Tour of Indore. Indore is the commercial capital of Madhya Pradesh. Some of the interesting tourist locations in Indore are Visit the Lalbagh Palace, Kanch Mandir, Indore Museum, Krishnapura Chattris, Rajwada, Khajrana. after noon Drop at Airport or Railway station for onwards journey. Private Transfers and Sightseeing as per the itinerary by AC Tempo traveler.